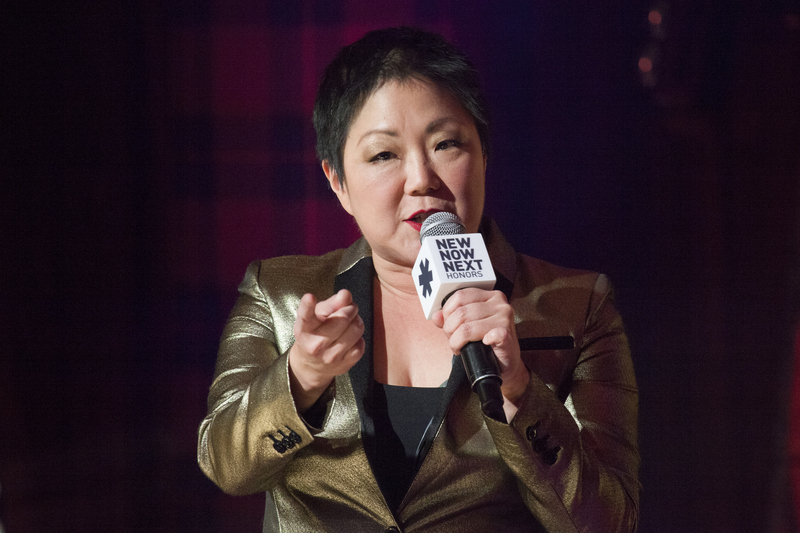 Margaret Cho Thinks Race Will Be An Important Conversation In 2016 & She's Adding To It With "DICKtator"
Comedian Margaret Cho has spoken out against GOP Presidential candidate Donald Trump many times throughout the months leading to Monday's Iowa Caucuses. Her reaction to his campaign and his offensive remarks even included a video and song, which she released in December. In an interview with Bustle, Cho talks about her Trump video and song, along with how she thinks race and diversity will shape 2016. In "DICKtator," Cho portrays several deceased world leaders — such as Attila the Hun and Margaret Thatcher — who have a clear message in their rhymes: "If you give a f*ck, don't vote Donald Trump." "It's a not-so-subtle wording of what might happen, but I think that's what art is for," Cho says. "I thought this situation required the most powerful artistic artillery there is, which is battle rhyme. I think the most aggressive you can get in art is having a beef with another rapper, so this is my beef with Donald Trump." Previously, Cho had spoken out against Trump hosting Saturday Night Live last year. She says that his campaign has shown her a whole different side of the nation. "The level of racism that is exposed by a Trump rally is what I'm reacting to," she says. "Not necessarily Trump himself, but the people he inspires. I didn't realize there were so many, and that's very scary." But Cho also speaks passionately about Trump himself and the offensive comments he's made on the campaign trail. "At first it was a joke, but now we're seeing the passion of his followers, and the passion they have for hatred," she says. "He's pandering to white rage, white supremacy, and this idea of white slight. That fear is in a lot of people, and it's very alarming." In response to this, Cho made the "DICKtator" video, which you can watch below. Cho is hosting Logo's New Now Next honors on Monday night, which spotlight topics that will get people talking in 2016. She believes that race will continue to be a major area of conversation this year. "Basically, making it possible for the world that we see in television and movies and all of the media is reflected back accurately," she says of what's ahead for media. "We'll see much more diversity racially, and in every arena, you're hearing different voices. This year is going to be a lot about race and a lot about defining the different kinds of ways we can have a voice. I think it's exciting." One thing that wasn't very exciting, however, was the lack of diversity among the 2016 Academy Award nominees. As one of the most prominent Asian-American voices in stand-up comedy, Cho herself is a pioneer. In 1994, she starred in the groundbreaking but short-lived ABC sitcom All-American Girl, the only American show to feature a predominantly Asian cast — until ABC's Fresh Off the Boat premiered in 2014. So she found the lack of diversity in this year's Oscar nods very disappointing. "This is the second year in a row this happened. Unfortunately, the Academy has overlooked tremendous performances by people of color, as they did last year," she says. "I feel that there needs to be a shift in Academy members. That's where we have to look to see diversity ... I want my industry to capture the rest of the world. I think film is even way behind television and any kind of digital media." Cho also speaks out against the whitewashing that has been going on in film — and the controversy that has followed. She cites examples such as the upcoming American Ghost in the Shell adaptation, (which cast Scarlett Johansson in the lead role, a Japanese character in the original manga and anime), Ab Fab : The Movie casting a white woman to play a Japanese designer, and last year's Stonewall movie (which overlooked the huge role people of color played in the historical event in question). Despite these missteps, Cho thinks positive change could be ahead, thanks to vocal audiences. "Finally, audiences are made aware of this before they get to the theater, before they make that decision to buy a ticket," she says. "We're now actually seeing the world catch up to wanting more from Hollywood, and I hope that we get it."